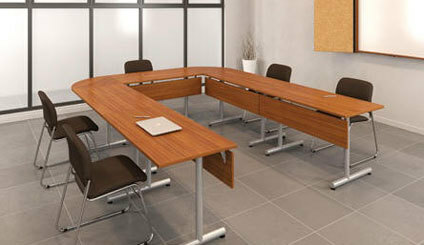 Artopex’s Laminate Genius Training Tables are available with fixed-top or flip-top surfaces. With casters or leveler footings,different styles of legs, the tables are easily reconfigured or stay solidly in place for permanent installations. In storage position, flip-top tables nest together to occupy a minimum of space due to the unique interlocking leg system. The Artopex Genius Training Tables can also come with electric pop ups for power and voice and data. It is important that you select the right Artopex furniture dealer to help you with your needs. Lynne Lemieux has the experience and knowledge to help you make the right choice. I highly recommend Artopex genius training tables in this configuration for either a classroom setting, training centre or boardroom. Artopex can add visual boards, video carts, lecterns and serving carts. Artopex Genius Training tables come in numerous colors and configurations to create a special meeting room to suit anyone’s’ needs with top quality at affordable prices. I have put the Artopex Genius Training tables in classrooms, open or private meeting areas for just about any company that wants to conduct business with comfort, functionality and good value. Artopex Genius Training Tables are Canadian made with a lifetime warranty. Call me so that I can help you with your needs.